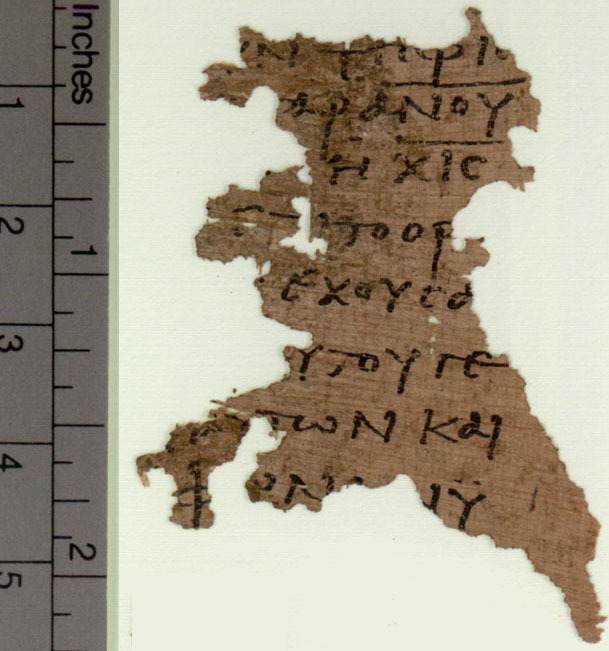 The newest volume of Oxyrhynchus Papyri contains a fragmentary papyrus of Revelation which is the earliest known witness to some sections (late third / early fourth century). A detailed discussion of its place in the MS tradition is given in the printed volume. You will find images at 150dpi and 300dpi in the papyri section of this site, accessible from the main menu. One feature of particular interest is the number that this papyrus assigns to the Beast: 616, rather than the usual 666. (665 is also found.) We knew that this variant existed: Irenaeus cites (and refutes) it. But this is the earliest instance that has so far been found. The number - chi, iota, stigma (hexakosiai deka hex)  is in the third line of the fragment shown below. But why does it matter what the number is? For that, we have to turn to ancient Greek ideas about numerology.